OK, I don't have a PS3 at the moment but, believe me, it's not because I don't want one. I just don't have the cash at the moment. Anyway, rest assured that as soon as I do have the cash to buy one, I'll be buying 3D Dot Game Heroes along with it. Of course, that's assuming this retro-riffic Zelda clone (from the looks of it, at least) is released in the U.S. Rumors abound that both Atlus and Ignition are fighting over the rights to the title, though, so hopefully that means we'll receive localization confirmation (and maybe even a release date?) in the coming weeks or months. 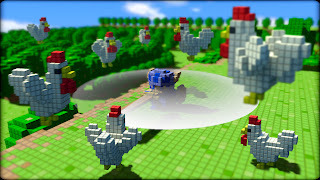 "3D Dot Game Heroes is set in the Kingdom of Dotnia. This world was once made up of 2D sprite art like something out of an old-school game. However, wanting to attract more people to the kingdom, the king decided to use technology to make everything 3D. This is where something goes horribly wrong, although just what that is has yet to be specified." Read the rest of what the IGN crew have to say about the game here. Or, check out this thread over at the great NeoGAF. Yeah, it definitely sounds like a cool game. I can't wait to see it in motion! As for the PS3's price - I imagine it'll stay at $299 for a while, but at some point Sony will have to drop it further (at least to $249). Hopefully I'll be able to buy one before that, but who knows?